How to convert PCL to JPEG and set image resolution? 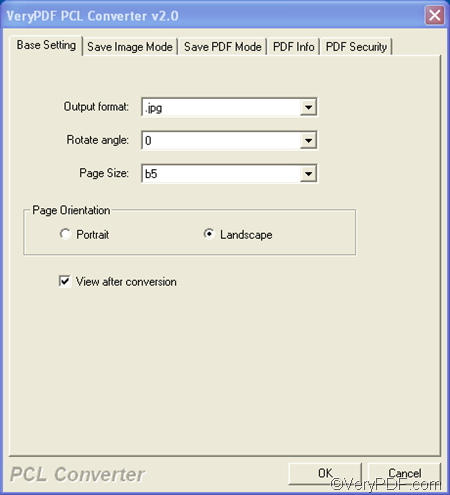 VeryPDF provides a good tool that can help you convert PCL to JPEG and set image resolution quickly. It’s called PCL Converter. This tool does not require third party applications. Not only can it convert PCL to JPEG, but also it can convert PCL to PS, TIF, JPG, BMP, PCX, PXL,etc. You can download this tool by clicking PCL Converter. Install it on your computer, and then you can go to convert PCL to JPEG and set image resolution either by command line or by GUI. The following part focuses on GUI. First of all, you need to open the interface of PCL Converter. You can double click its icon on the desktop to run this tool. If you can’t find the shortcut icon on the desktop, you can click Start, > All Programs, > VeryPDF PCL Converter v2.o, > VeryPDF PCL Converter v2.o. When you see the interface as follows, you can proceed to the next step. Secondly, you need to add the PCL files you want to convert. Please click the Add File(s) button to open the dialog box where you can select the files. Then, after you choose the PCL files and click Open in that dialog box, you can view the file names, types, paths, sizes, and input dates of the selected files in the list box on the main interface. To delete some files in the list box, you can select them and press Delete on your keyboard. To change the order of the listed files, you can click the Move Up and Move Down button under the list box. After input the PCL files, please proceed to the next step. Thirdly, please click the Setting button to open the dialog box as follows. In this dialog box you can set output format, set image resolution, set color depth, and other options. As you can see, there are five tabs. This time, we only need to use the first two tabs. The first tab Base Setting is the default one. You can set output format in the default tab control: click the arrow in the Output format combo box, and then select .jpg from the drop down list. To set image resolution, please click the second tab Save Image Mode, > click the arrow in the Image Resolution combo box, > select an item from the drop down list. > Click OK after setting options. Fourthly, please click Start on the main interface to open the Browse for Folder dialog box, > choose a folder to export the result JPG/JPEG files into, > click OK. The computer will prompt to convert PCL to JPEG without delay. This is how to use the GUI version of VeryPDF PCL Converter to convert PCL to image format. If you are a developer or want to apply it on servers, please visit: http://www.verypdf.com/pcltools/index.html#dl . How to convert PCL to TIFF and set image resolution? How to convert PCL to PCX and set image resolution? How to convert PCL to JPG and set image resolution? How to convert pxl to jpg via command line? Convert pcl to pcx and set page size via command line? This entry was posted in VeryPDF Blog and tagged pcl to jpeg, pcl to jpg, set image resolution, set resolution. Bookmark the permalink.